In the next step, the scientists plan to make use of the fact that the Rubidium atom can occupy different quantum states, only one of which interacts with the resonator. If the atom occupies the non-interacting quantum state, the light behaves as if the atom was not there. Thus, depending on the quantum state of the atom, light is sent into either of the two glass fibres. This opens up the possibility to exploit some of the most remarkable properties of quantum mechanics: “In quantum physics, objects can occupy different states at the same time”, says Arno Rauschenbeutel. April 10, 2019 - It took a 'virtual' telescope to actually picture a black hole Science News for StudentsHere's how scientists connected eight observatories across the world to create one Earth-sized telescope. This is what it took to create an image of a black hole. September 4, 2018 - Causality disappears at the flick of a switch CosmosResearchers demonstrate superpositions using a device comprising a single atom. Andrew Masterson reports. April 26, 2018 - Researchers Use Graphene to Confine Light to the One-Atom Limit Interesting EngineeringGraphene has been used by scientists to squeeze light to just one atom. The breakthrough will help further development of ultra-small devices. April 20, 2018 - Graphene sets a new record on squeezing light to one atom Science DailyResearchers reach the ultimate level of light confinement -- the space of one atom. This will pave the way to ultra-small optical switches, detectors and sensors. February 3, 2019 - Scientists Realize Optical Version of Schrödinger's Thought Experiment SciTechDailyA group of researchers led by the Max Planck Institute has now realized an optical version of Schrödinger's thought experiment in the laboratory. March 17, 2019 - How Did We Figure Out Atoms Exist? Space.comHere's how scientists discovered — and characterized — the atom. March 24, 2019 - 6 Things You Should Buy at Stio's Flash Sale Outside MagazineSpring has sprung, but there's never been a better time to stock up on year-round gear. Save up to 40 percent on our favorite Stio items from 3/24 to 3/26. February 4, 2016 - Single atom optical modulator Electronics WeeklySwiss researchers have made an electro-optic modulator from a single atom. November 4, 2013 - A Single-Atom Optical Switch PhysicsResearchers have succeeded in creating a microphotonic optical switch, in which a single atom redirects photons down different fiber paths. April 24, 2018 - Scientists Have Used Graphene to Squeeze Light Into a Space Smaller Than Its Wavelength ScienceAlertWith the help of the increasingly useful material graphene, scientists have managed to confine light into the smallest space possible - the size of a single atom. September 5, 2018 - Quantum gates between atoms and photons will scale up quantum computers Space DailyRehovot, Israel (SPX) Sep 05, 2018 - The quantum computers of the future will be able to perform computations that cannot be done on today's computers. February 13, 2018 - Here Is a Photo of a Single Atom Popular MechanicsThe photo won the top prize at a science photo competition. February 5, 2019 - Scientists Just Defied Chemistry Basics by Flipping 'Left-Handed' Molecules With Light ScienceAlertUsing a beam of light, chemists have figured out how to turn an asymmetrical molecule into a mirror image of itself, with the asymmetry on the other side. November 14, 2018 - Scientists Are About to Redefine the Kilogram and Shake Up Our System of Measures Smithsonian.comAfter more than 100 years of defining the kilogram according to a metal artifact, humanity is preparing to change the unit based on a constant of nature. June 14, 2018 - Photons map the atomic scale to help medicine and more Science News for StudentsAt a big lab outside Chicago, a gigantic beam of speedy electrons is helping researchers fight diseases, build better electronics and more. December 11, 2018 - Answering the mystery of what atoms do when liquids and gases meet Phys.orgHow atoms arrange themselves at the smallest scale was thought to follow a 'drum-skin' rule, but mathematicians have now found a simpler solution. March 12, 2019 - A New Way To Build Atomic Clocks Could Make GPS Even Better Popular MechanicsThanks to a new discovery, atomic clocks of the future might be handheld instead of the size of a refridgerator. January 22, 2019 - From atoms to nanoparticles to living matter Nanowerk(Nanowerk Spotlight) Atoms form molecules or crystals using their outermost electrons through interactions between single elements or multiple elements. October 12, 2018 - Researchers quickly harvest 2-D materials, bringing them closer to commercialization Phys.orgSince the 2003 discovery of the single-atom-thick carbon material known as graphene, there has been significant interest in other types of 2-D materials as well. November 1, 2018 - Quantum on the edge: Light shines on new pathway for quantum technology: World-first demonstration of topologically protected biphoton states Science DailyScientists have for the first time demonstrated the protection of correlated states between paired photons using the intriguing physical concept of topology. January 7, 2019 - Global warming of oceans equivalent to an atomic bomb per second The GuardianSeas absorb 90% of climate change's energy as new research reveals vast heating over past 150 years. February 21, 2017 - Engineers Develop DNA Light Switch ENGINEERING.comControllable DNA switch has nano-electronics applications. 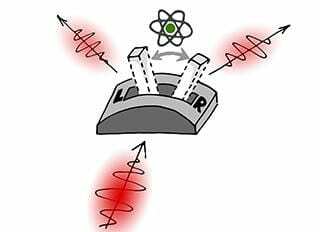 December 2, 2016 - Shape matters when light meets atom Science DailyMapping the interaction of a single atom with a single photon may inform design of quantum devices, report scientists in a new article. May 10, 2018 - Neglected atom has top properties for atomic clocks: Researchers propose that lutetium clocks could outperform today's timekeepers Science DailyLike watchmakers choosing superior materials to build a fine timepiece, physicists have singled out an atom that could allow us to build better atomic clocks. November 3, 2016 - Scientists set traps for atoms with single-particle precision MIT NewsScientists at MIT and Harvard set traps for atoms, building 50-atom structures from the bottom, up, that could lead to large-scale arrays for quantum computing. September 20, 2017 - A Brain Built From Atomic Switches Can Learn Quanta MagazineA tiny self-organized mesh full of artificial synapses recalls its experiences and can solve simple problems. Its inventors hope it points the way to devices. September 21, 2018 - How an atom forms a 'ghost' bond with a partner that isn't there Nature.comElectric and magnetic pulses can fool an electron into reaching out for an illusory atom. February 27, 2019 - Physicists are pushing the periodic table to its limits Science NewsThe hunt for the next elements on the periodic table might turn up superheavy atoms that flaunt the rules of chemistry. January 17, 2019 - Schrödinger's Cat Learns To Fly Innovation OriginsScientists at the Max Planck Institute of Quantum Optics have realized Erwin Schrödinger's gedanken experiment with light pulses in the laboratory. June 12, 2018 - Teleportation: will it ever be a possibility? The GuardianInstant travel seems further away than when Captain Kirk first reanimated, but scientists are fighting to make it happen. October 15, 2018 - Big Brains podcast: Quantum technology goes from sci-fi to reality UChicago NewsProf. David Awschalom on the future of quantum technology. July 5, 2018 - Semiconductor quantum transistor opens the door for photon-based computing Phys.orgTransistors are tiny switches that form the bedrock of modern computing; billions of them route electrical signals around inside a smartphone, for instance. March 7, 2019 - PreSonus ATOM Pad Controller Review American SongwriterPreSonus ATOM pad controller The PreSonus ATOM is the manufacturer's first pad controller, an essential piece of gear for anyone who uses virtual. February 1, 2019 - 'Quiet' light Phys.orgSpectrally pure lasers lie at the heart of precision high-end scientific and commercial applications, thanks to their ability to produce near-perfect single-color light. March 11, 2019 - Graphene-based device opens path to ultrasensitive... Market Business NewsWe are one step closer to ultrasensitive biosensors thanks to a graphene based device which researchers have combined with nano-sized gold ribbons.